We recently had the opportunity to see the Harlem Globetrotters in Vancouver, BC Canada. It was an experience like no other and one that every age and member of the family enjoyed. I have to say that the Harlem Globetrotters provide a night of world class entertainment that would be hard for any act to follow. Our night started with a little special treatment as we were lucky enough to have a meet and greet with a couple of Harlem Globetrotters. So we were whisked right in and taken to special seating to wait for our meet and greet. That special seating was the players’ seats! You can imagine the excitement! 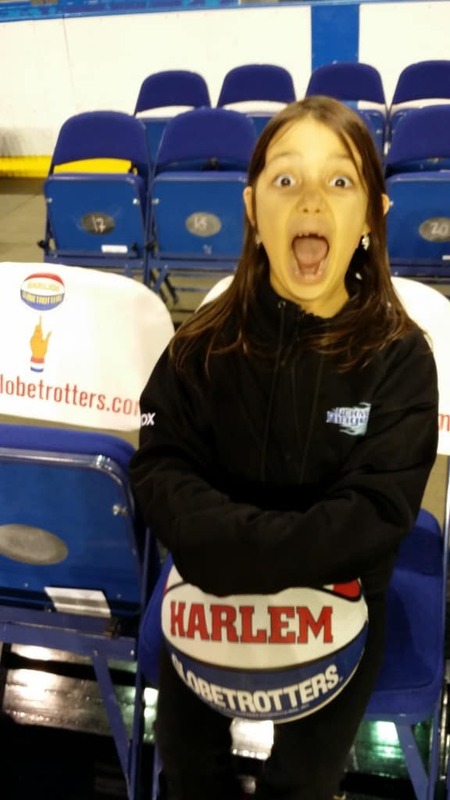 The merchandise table was right down court side so we took the couple of minutest we had to browse the table of Harlem Globetrotter official gear. I though that for the most part, the merchandise was reasonably priced. 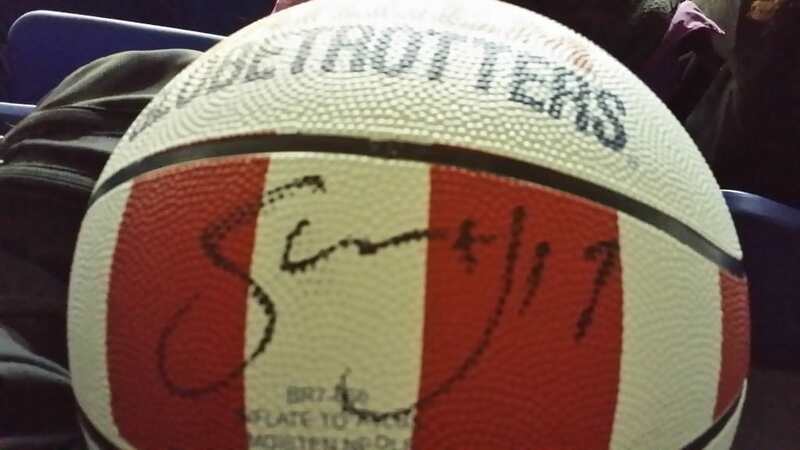 An official Harlem Globetrotter basketball was $30 and yep, we purchased a couple of them. So picture us, sitting in the players’ seats and holding an official Harlem Globetrotter ball. Can life get any better? Well it can, but first, I have to share that I asked my Little One if she was going to have her basketball signed. Her answer was no way mom, if they write on it, they will wreck it! Next we were lead away to meet a couple of the Harlem Globetrotters. My Little One, a 6 year old girl, was pretty excited, but a little reserved as well. Then the two Harlem Globetrotters came in; Spider and Sweet J. Well my Little One’s eyes lit up as soon as she saw Sweet J. Yes, a female Harlem Globetrotter. I looked at my Little One’s face and then asked again; Are you going to get them to sign your ball? My Little One could only nod her head yes as she stared at Sweet J. So my Little One quickly approached Sweet J and had her ball signed. She then turned and walked away. Spider offered to sign her ball as well and my Little One shook her head no. I had to say to Spider, sorry, but she really only wants the Sweet J’s autograph, a girl thing. Sweet J smiled and said “That’s what I’m talking about.” It was all rather adorable. Then it was photo time. When my Little One went up to have her photo, Spider went to walk away thinking she would not want a photo with him either, but she did. Poor Spider, we love you too, but there is nothing like a female role model for a little girl. Sweet J and Spider were amazing and took everything in stride. They were great. The show was breathtaking. I cannot remember the last time that I left a show with my family and our face was sore from smiling and laughing so much. It was amazing and if they come to a city near you, you have to see them. The Harlem Globetrotters is a show that is good enough to be on your Bucket List of those must do things. I would go time and again for sure. Between skill with the ball and their talents at entertaining, the show is brilliant. 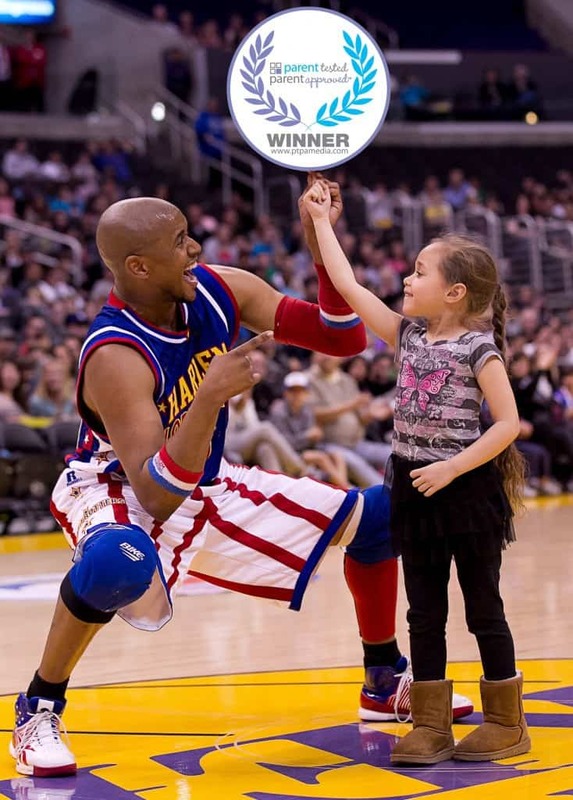 There is no wonder that the Harlem Globetrotters are a Parent Tested Parent Approved Award Winner. 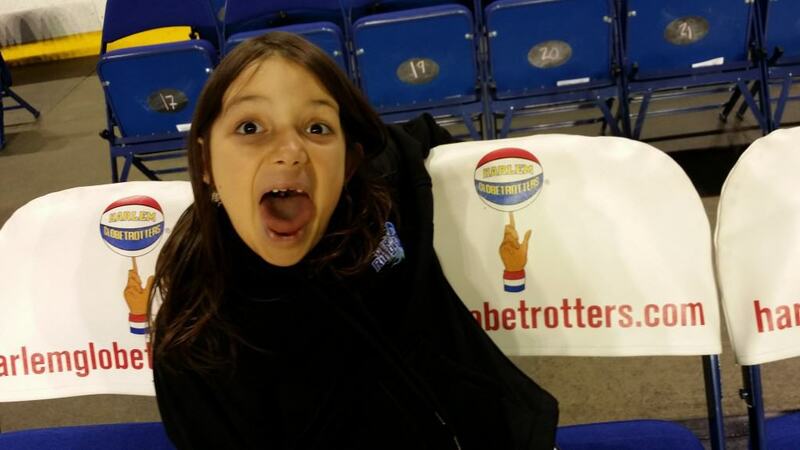 As if that is not enough, the Harlem Globetrotters know how to get the fans into the game with the Fans Rule. Each quarter a fan voted rule is implemented in order to make the game more interesting and entertaining. It really adds a bit more skill and humor to the game and is really a great way to have the fans feel even more a part of the show. Everything from trick shots, to extra points and event a 4 point circle, the Harlem Globetrotters will have you smiling, cheering, laughing and even doing the wave. Best of all, you do not even need to know or understand basketball in order to have an amazing time watching the Harlem Globetrotters. After the show, the players stay around to sign autographs. I really recommend that you get a t shirt or ball and get a few autographs with your kids. They are amazing players and people who love meeting their fans. 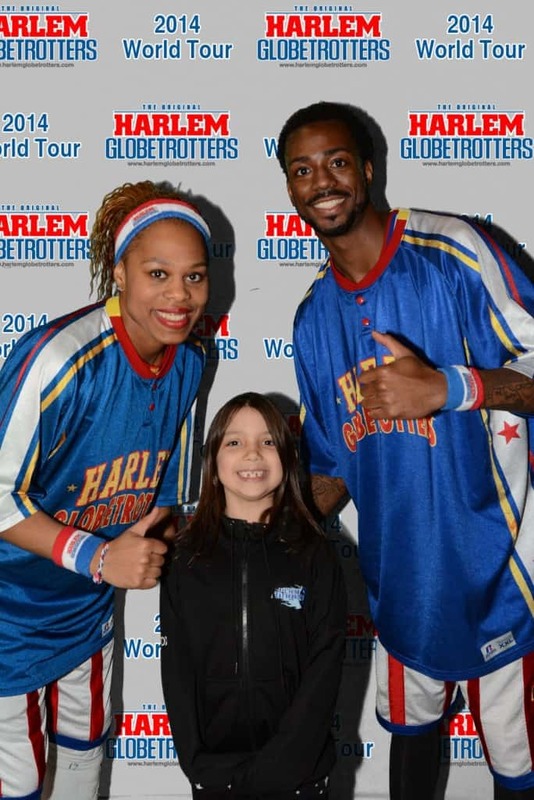 The Globetrotters continue their 2014 “Fans Rule” tour throughout the U.S. and Canada through the end of April. In all, Globetrotters’ tour will visit over 250 cities. Check out their schedule at http://www.harlemglobetrotters.com/tickets. Save $7 off each ticket by using the promo code “PTPA” when you make your purchase. You can stay connected to everything Harlem Globetrotter on Facebook, Twitter, Instagram and Youtube. Disclaimer: MomMomOnTheGo was provided tickets for the purpose of conducting this review. As always, MomMomOnTheGo only supports companies and products that she loves. This is Sweet J! I dont know why I am just now coming across this page but I am grateful that you guys had a blast! I am blessed to be a role model for young girls and things like this makes me love what I do. Thanks so much!